Spending most of your time wirelessly perusing music on Internet radio? Here’s a device that makes lo-res files sound golden. AS HAS BEEN said before on Witchdoctor (mostly by me), the future is wireless. Make no mistake that the masses are embracing wireless audio in a big way, and more often than not, the wireless network isn’t even Wi-Fi as we know it. Rather, it’s a simple Bluetooth link between a smartphone and a receiver, usually housed in a small wireless speaker system similar to Logitech’s Boombox (reviewed here) or Sony’s SA-NS510 (reviewed here). Audiophiles and other assorted hi-fi nuts will continue to follow the quality over quantity path, which is a very good thing; without that attitude, the turntable would have died decades ago. Still, even vinyl and high-res audio devotees will want access to the wealth of streamed music that’s easily available via a number of websites and smartphone apps. And they’ll want to maintain as much audio quality as possible regardless of the low-res nature of most of today’s streamed content. 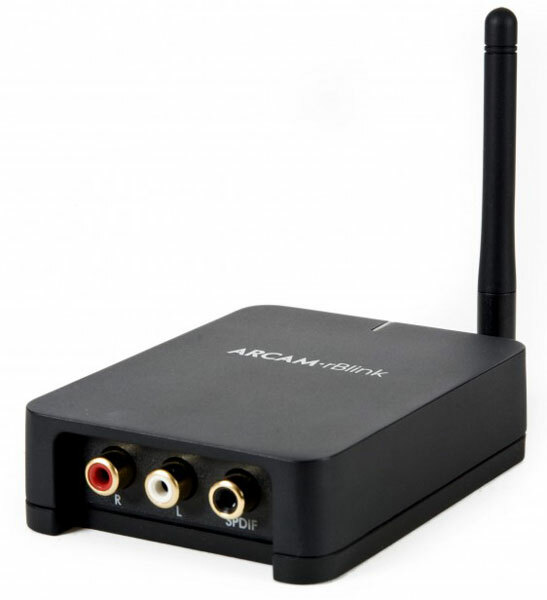 Which is where devices like Arcam’s rBlink Bluetooth receiver come in. The rBlink is similar to QED’s uPlay Plus (reviewed here) – small, simple and designed to stream music from any Bluetooth enabled device to an audio system – the digital stream in comes in the one end, and analogue audio runs out the other side. Unlike the mundane Bluetooth headset you used to stick in your ear, the rBlink has been specifically engineered with audio quality in mind. At $399, the rBlink has to be considered a premium option compared to the $249 uPlay Plus, and from a build quality perspective, it’s certainly well ahead. Plastic makes way for metal because like the other r-series Arcam products, the cigarette-pack sized cast aluminium rBlink feels like it’s machined from a small brick of cast alloy. The compact size makes it easy to stash alongside a full sized stereo component on a hi-fi rack, but the double ended design means that the rBlink has its cables poking into both the front and the back of the unit. The power lead runs into the front, alongside the Bluetooth antenna, while the RCA analogue outputs and coaxial digital output are housed around the back. Not the end of the world, but neat freaks will find the layout puzzling and annoying. Internally, the rBlink features a TI PCM5102 DAC, which is the same one found in Arcam’s lovely sounding rPac USB DAC/headphone amp, which bodes well for the sonic abilities of the wireless device. Like most modern Bluetooth devices, setup is truly easy – a push of the pairing button on the rBlink leads to almost instant connection to a compatible device and music plays immediately. Note to self – the antenna isn’t optional. In a burst of enthusiasm, I set up the rBlink without it and was rewarded with signal dropouts as soon as I ventured more than a few feet away. With the antenna in place, the connection to my iPhone was as reliable as Auckland’s winter rain. I ran the rBlink into a StereoKnight Silverstone Balance passive preamp, Viganoni and Viganoni Sachem monoblock power amps with both Focal Chorus 816V and Theophany M5 Series 2 loudspeakers at the noisy end. After a few months of use, I’m totally convinced that QED’s uPlay Plus is a remarkably good sounding unit, but it’s nice to know that the $150 premium demanded by Arcam isn’t just down to the rBlink’s better build quality and sharper industrial design. As good as the uPlay Plus is, the Arcam has a slight advantage in its outright dynamics. The rBlink pushes substantially more voltage from its RCA sockets as evidenced by a huge leap in volume levels when switching from the QED. Even when the levels are equalised, the rBlink benefits from a greater dynamic range and a better sense of energy and power. When I was first introduced to the rBlink at an Arcam event (as seen here), it was pointed out that an extended dynamic range had been engineered into the unit to compensate for any losses incurred in the streaming process. I haven’t been able to ascertain if this is in fact what I’m hearing, but it certainly sounds like it. 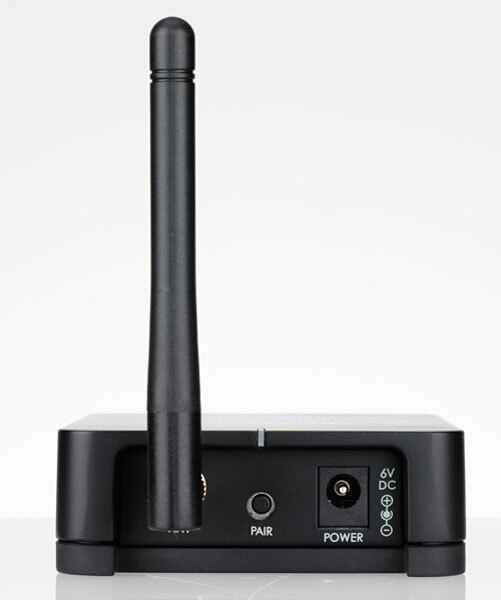 Detail levels are very high for a Bluetooth receiver, with plenty of subtlety and textural information making it to the amplification chain across the wireless connection. The overall balance is smooth, and there’s a good amount of illumination at the top end for a Bluetooth stream, which helps to extract the maximum amount of goodness from the ether. There’s nowhere near as much artificiality to the treble as one might imagine from a wireless connection, in fact, it comes across as being quite refined. Low quality streams from Pandora sounded as good as I’ve ever heard them bar through Sony’s eccentric PHA-1 USB headphone amp/DAC (reviewed here) and Sennheiser HD650 ‘phones. The better the quality of the inbound stream, the better the rBlink and the overall system sounded. At 320kbps, I was hugely impressed by what I was hearing, and while the wired connection from my Pro-Ject Dock Box Fi was still ahead in terms of top end clarity and general air and spaciousness, the gap had closed. For Arcam devotees, the new A19 integrated amp (our review unit is coming soon) has a power output specifically designed to drive the rBlink. The quality of this power supply will be far better than the little wall-wart that comes with the rBlink and should further enhance the sound quality. If the review unit is still around when the A19 arrives, I’ll be sure to report back on the merits of this brand-specific integration. The only fly in the rBlink’s ointment is its weird cable layout, but that’s a minor issue, and one that’ll seldom be encountered. In every other respect, this is a fabulous product, and another well considered and cunningly engineered r-series release from Arcam. Four hundred smackers seems like a lot of money to spend on this kind of device, but given how many hours I spend locked onto my favourite stations on Pandora, owning a high-quality way to connect all that music to my audio system makes more sense than buying 20 more CDs. In short, Arcam’s rBlink is the best sounding Bluetooth receiver I’ve yet heard, even without tapping into its digital output – no external DACs were on hand during the review but the analogue sound in its own right is simply excellent. A wired connection still sounds better and discs spun on a good CD player sound even better still. However, the millions of songs just waiting online mean that my iPhone and MacBook Pro are my sources of choice for musical exploration these days. If you feel the same way, then the rBlink would be the perfect cohort.